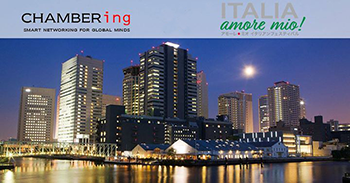 The Italian Chamber of Commerce in Japan is proud to present Amore Mio! Chambering, a networking event to be held on Thursday 19th April. The event that takes place from 7 pm to 9 pm is a wonderful opportunity for companies to expand their network with professionals from different countries and different backgrounds, while enjoying selected wines and Sicilian specialities catered by Angelo Court Tokyo, the A.Q.I. certified Sicilian restaurant in Yaesu.